The philosophy is simply to apply the Scientific Method to Newton’s Universal Law of Gravitation. This is a general physical law derived from empirical observations by what Newton called induction. It is a part of classical mechanics and was formulated in Newton’s work Philosophiæ Naturalis Principia Mathematica (“the Principia”), first published on 5 July 1687. The falsification is well documented. Though in 1932, Jan Hendrik Oort was the first to report measurements that the stars in the Solar neighborhood moved faster than expected when a mass distribution based upon the visible matter was assumed, this measurement was later determined to be essentially erroneous. A few years later, Horace Babcock reported in his PhD thesis measurements of the rotation curve for Andromeda which suggested that the mass-to-luminosity ratio increases radially. He, however, attributed it to either absorption of light within the galaxy or modified dynamics in the outer portions of the spiral and not to any form of missing matter. In 1959, Louise Volders demonstrated that spiral galaxy M33 does not spin as expected according to Keplerian dynamics. Following this, in the late 1960s and early 1970s, Vera Rubin, a young astronomer at the Department of Terrestrial Magnetism at the Carnegie Institution of Washington presented findings based on a new sensitive spectrograph that could measure the velocity curve of edge-on spiral galaxies to a greater degree of accuracy than had ever before been achieved. Together with fellow staff-member Kent Ford, Rubin announced at a 1975 meeting of the American Astronomical Society the discovery that most stars in spiral galaxies orbit at roughly the same speed, which implied that their mass densities were uniform well beyond the location with most of the stars (the galactic bulge), a result independently found in 1978. Rubin presented her results in an influential paper in 1980. These results suggest that either Newtonian gravity does not apply universally or that, conservatively, upwards of 50% of the mass of galaxies was contained in the relatively dark galactic halo. Met with skepticism, Rubin insisted that the observations were correct. 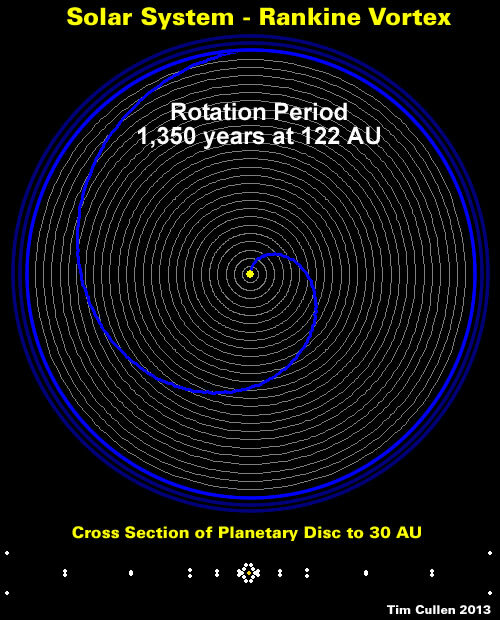 Based on Newtonian mechanics and assuming, as was originally thought, that most of the mass of the galaxy had to be in the galactic bulge near the center, matter (such as stars and gas) in the disk portion of a spiral should orbit the center of the galaxy similar to the way in which planets in the solar system orbit the sun, i.e. where the average orbital speed of an object at a specified distance away from the majority of the mass distribution would decrease inversely with the square root of the radius of the orbit. Observations of the rotation curve of spirals, however, do not bear this out. Rather, the curves do not decrease in the expected inverse square root relationship but are “flat”, i.e. outside of the central bulge the speed is nearly a constant. Sadly, the scientific establishment deviated from the Scientific Method by refusing to accept the [repeated] falsification of a Newton’s [sacrosanct] Law of Universal Gravitation. Instead, the scientific establishment preferred to keep its Newtonian belief system intact by accepting the mathematical invention of Dark Matter. Dark matter came to the attention of astrophysicists due to discrepancies between the mass of large astronomical objects determined from their gravitational effects, and the mass calculated from the “luminous matter” they contain; such as stars, gas and dust. It was first postulated by Jan Oort in 1932 to account for the orbital velocities of stars in the Milky Way and Fritz Zwicky in 1933 to account for evidence of “missing mass” in the orbital velocities of galaxies in clusters. Subsequently, other observations have indicated the presence of dark matter in the universe, including the rotational speeds of galaxies, gravitational lensing of background objects by galaxy clusters such as the Bullet Cluster, and the temperature distribution of hot gas in galaxies and clusters of galaxies. Returning to the Scientific Method simply requires letting “reality speak for itself”. The chief characteristic which distinguishes a scientific method of inquiry from other methods of acquiring knowledge is that scientists seek to let reality speak for itself, supporting a theory when a theory’s predictions are confirmed and challenging a theory when its predictions prove false. The reality of Spiral Galaxies speaks loud and clear. 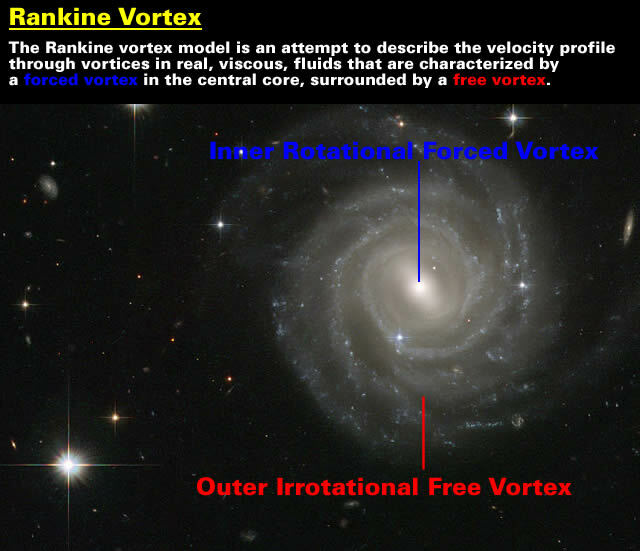 The phenomenon that is called Gravity simply reflects vortex pressure. The dynamics of a Forced [Rotational or Rigid-body] Vortex provides the rationale [and mathematics] for the “Inverse Square Law” of gravitation. The fluid motion in a vortex creates a dynamic pressure (in addition to any hydrostatic pressure) that is lowest in the core region, closest to the axis, and increases as one moves away from from it, in accordance with Bernoulli’s Principle. One can say that it is the gradient of this pressure that forces the fluid to curve around the axis. In an irrotational vortex flow with constant fluid density and cylindrical symmetry, the dynamic pressure varies like P∞ − K/r2, where P∞ is the limiting pressure infinitely far from the axis. This formula provides another constraint for the extent of the core, since the pressure cannot be negative. The free surface (if present) dips sharply near the axis line, with depth inversely proportional to r2. The Oort constants are empirically derived parameters that characterize the shearing motion and vorticity of the Milky Way galaxy. where V_0 and R_0 are the rotational velocity and distance to the Galactic center, respectively, measured at the position of the Sun. As derived below, they depend only on the motions and positions of stars in the solar neighborhood. As of 1997, the most accurate values of these constants are A = 14.82 ± 0.84 km s−1 kpc−1 and B = -12.37 ± 0.64 km s−1 kpc−1. From the Oort constants, it is possible to determine the orbital properties of the Sun, such as the orbital velocity and period, and infer local properties of the Galactic disk, such as the mass density and how the rotational velocity changes as a function of radius from the Galactic center. The Oort constants can greatly enlighten one as to how the Galaxy rotates. As one can see A and B are both functions of the Sun’s orbital velocity as well as the first derivative of the Sun’s velocity. B describes the angular momentum gradient in the solar neighborhood, also referred to as vorticity. 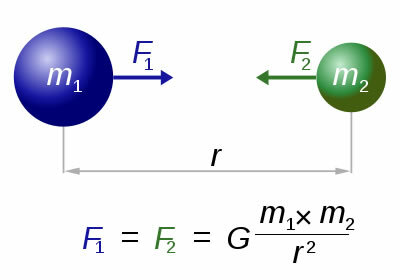 Advocates for Newton’s Law of Universal Gravitation might enjoy calculating the Gravitation Force exerted by two weightless orbiting objects. Looking for something that doesn’t exist (Dark Matter) is a great career choice because you never have to find it. Black Holes also seem to fall within that job description. Aether has mass and physically occupies three dimensional space. There is no such thing as non-baryonic dark matter anchored to matter. Matter moves through and displaces the aehter. The Milky Way’s halo is not dark matter traveling along with the matter the Milky Way consists of. The Milky Way’s halo is the state of displacement of the aether. What is referred to geometrically as curved spacetime is the state of displacement of the aether. No Dark Matter No Black Holes No Big Bang or any of the current 4 big bangs No comets of dirty Ice and Snow – “Gravity is not enough” Richard Feynman 1983 – Our Sun is not thermo-nuclear powered it is Electric – The Universe is Electric – we are electric ! Ashley’s Law: We are electric! I happen to agree. Anthony Peratt’s work shows rotational dynamics of galaxies. As Colin notes below – please evaluate Coulomb’s law. Brilliant. Fell off chair laughing. How ironic, how true. Wish you well and look out for a book that dispels dark matter, and tells a lot of other things which will be explained and will give answers to questions that not answered by present errm supposed theories. Give me an e-mail in about 6 weeks time. it’s sad that a person with such poor understanding of basic physics is trying to de-bunk physics. First of all, Newton’s law of gravity is considered “classical mechanics”. Modern physics (any physics after 1904ish, think “theory of relativity”) explains much of what is shown as “evidence” that Newtonian gravity doesn’t work. I’ll try a brief, line by-line response to the “Update. 1) look up the “graviton”. Or field physics, not magic, just fields. 2) Nope, not true, “gravity” travels at the speed of light, like waves in other fields as well. 5) I’m not sure what you think is disagreeable. Newton’s theories may have been juvenile, as it pertains to astronomy, but his law of gravity does not disagree with the information provided in the noted article. The moon DOES orbit the sun, as does the earth. Since they have a similar orbital distance, they have a similar orbital speed (in agreement with Keppler and Newton), and due to their proximity, are also able to orbit each other… Not sure the disconnect. 7) Not Fairy Dust, you sardonic fool. Dark matter, simply mater which isn’t hot enough to emit measurable EM radiation. Also, relativity… Also, stars aren’t fixed in the arms of a galaxy. Galaxy arms are more like a pressure wave moving through a cloud of stars, so not governed by newton’s ideas about point particles… So… not applicable. Even if Dark Mater is dubious, this argument has nothing to do with Newton. I think that “mantle plumes” fall into the same category of “invoke something deep, dark, exotic, spooky, and unfalsifiable”. the solution to the missing mass problem has been discovered but shall be unveiled shortly. Liquid vortex (LV) sheds light on the black holes (BHs) essentials. Gravity-driven liquid vortex – a generic analog of a cosmic black hole. Here is a few exciting things we can learn from it? Part 4 – Summarizing the most important points. Vortices could be found everywhere around us. Assuming different kinds of vortices possess common generics, we can get an insight in understanding the hardly observable ones, for instance BHs, by observing the easily observable ones, like LVs. Exploring LVs, also allows to run the observations with reasonable resources, in reasonable time, under variety of conditions and to observe the developments beneath the funnel bottom, which, in reference to the BHs, can be considered as an analog of the BH bottom. The LV I’ve observed was arranged to confine its developments in the thin surface layer thus making it to act as a two-dimensional one. The collection of LV videos could be accessed at YouTube under my name Yehiel Gotkis (https://www.youtube.com/user/YehielGotkis). Please slow down the video rate as much as you can to see more details. Analysis of the observations leads to a shocking grasp questioning even the widely-adopted views on dark matter and dark energy. Observations, analysis, interpretations and conclusions. · The LV was emitting double-spiral waves known to carry momentum and associated kinetic energy transferable to other objects. The double spiral generation was induced by the spinning bottom asymmetry shaped as a distorted digit 8. The fact that generation of propagating away waves was caused by the spinning vortex asymmetry, in reference to the BH case, means that spinning BHs, being of even slightly asymmetric geometry, should generate/re-emit a part of the acquired mass/energy, as gravitational waves, back into the space. Which, in cosmic timescale, should make a significant amount of it, meaning that the Universe should be filled with energetic gravitational ripples. As the ocean surface ripples. · Also, the spinning double spiral wave profile, while swelling from the LV center, should oscillate, and it indeed does, which at some observation angles looks like wobbling (check, for example, “Liquid vortex upper double spiral wave generation” video \https://www.youtube.com/user/YehielGotkis), providing a simple suggestion on interpretation of the Quasi Periodic Oscillation (QPO) phenomenon. The spacetime and the matter are inherently engaged with each other. The BHs are to be thought of pulling-in not only the matter but also the spacetime, whirling around the BH as liquid whirls around the LV. As per the BHSSR, at the galactic periphery, where the pulling-in force is diminished, the keeping on centrifugal force, induced by the spinning spacetime, accelerates the stars away from the galaxy center. · Another important LV occurrence is associated with the development of a galaxy-like spiral shape when a handful of shredded dry leaves was spread over the vortex area (video at https://www.youtube.com/watch?v=l8HBO6E8LAg). This concept provides explanations for numerous cosmic phenomena. The matter and the spacetime are adhered to each other as an inseparably engaged duo: where the spacetime there the matter. And vice versa. Surprisingly, one of the best resources for elucidating how the universe really works is the book “Etidorpha” by John Uri Lloyd. In the book, the true nature of gravity is explained, several misconceptions of modern science are shown through simple experiments, the topography of the inner Earth is described and time is revealed in its proper state: it’s permanent and quiescent. Matter and force fly, time rests. Hey man, It is not gravity driving the systems in a spiral galaxy, it is electricity. The galaxies are mostly plasma and electricity rules plasma. Birkelend currents explain most of what is seen and is no mystery. They explain everything from galactic rotation speeds, formations of stars, what are Quasars, the weather on planets, comets and asteroids and thousands of other phenomena which gravity models are just unable to predict. Remember, most of these formulas were hashed out when electricity was still a novel property. Even the Sun is electric. Many of the electric principles can be proved in laboratory experiments and not computer models. Nor does it need to rely on Dark Matter/Energy “hocus pocus”. Anyone who says it is there but does not interact is brain dead and wrapped up a mathematical idea which bears little resemblance to the real universe. Why do they get so many things wrong which they euphemistically call “surprise/surprising? From comets(which are not water ice balls to Jupiter’s internal heat. etc.,etc. The use of electricity to describe what is happening leaves one not very surprised. One day relativity will be scrapped and we will e allowed to truly investigate the universe.One will see that mass can change and red shift is not always accurate. Read up on both of these men: Hans Albers who won the Nobel prize in physics and Kristian Birkeland who studied the auroras and the role of electricity. For some reason, when I see or hear the word SPACETIME I experience something akin to sucking a lemon. A kind of mild pain in my jaw and something in my mind that says “don’t ever do that again”. The word space conjures-up thoughts of vast empty nothingness. Time has never been proven to exist. Time is a moving angle that measures the rotation of the Earth with reference to the stars planets and the Moon. Atomic clocks are calibrated to run on a second that only existed in 1900 There is no universal tick-tock. And so we have two meaningless words cobbled together to form the basis of modern physics. There is a fogical lallacy here somewhere. Yes, it is the nasty habit of self-asserted scientists to reify that which has no physical form. Jan Oort had a dilemma. Like the author pointed out, rather than go back and re-think his assumptions, he proceeded to invent explanations that cannot and remain impossible to verify. Reblogged at nextexx.com for my collection on Newton. 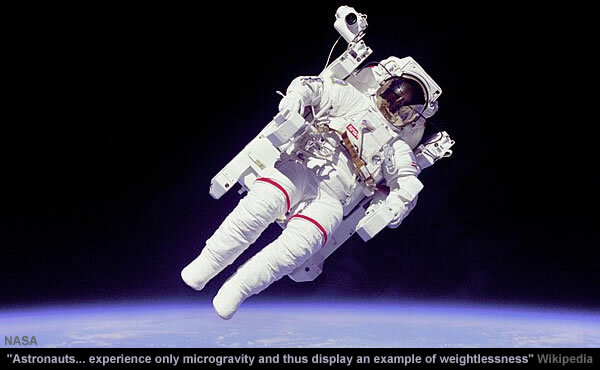 Gravity is universal pressure, from Aether. “Particles” that come into existence in a vacuum!!! The apparent attraction is simply because the area of a body prevents the pressure reacing another body, so they move towards each other. No attraction, just lack of repulsion. This has BIG implications for gravity on other bodies: there is an upper limit! No crushing graviatation on the surface of the gas giants. Yes, they have a surface. We know area is important as the strength of the loss of repulsion varies according to the square of the distance. If weight or mass were the determinant, then the cube of the distance would figure. Has anyone calculated the “gravity” of any of the asteroids/comets we land on? For that matter, has anyone verified if any of the Mars transmissions have actually come from Mars?